have all assumed that the reindeer were male -- and we were wrong. 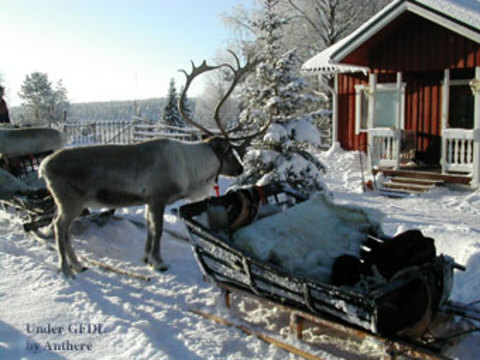 After a good look at reindeer physiology, scientists say that if Santa's reindeer were males, he made a bad choice. It is the female reindeer who are outfitted to handle the hard December journey. After mating season ends in early December, the males have slimmed down to a mere 5% body fat, while the females enter the winter with a toasty 50%. This allows their hollow hairs to trap and conserve more body heat. Their circulatory systems are also set up to keep the limbs from drawing heat away from the body's core. Further evidence that the reindeer are girls shows up in the fact that all of the pictures of Santa show him with antlered reindeer pulling his sleigh. Male reindeer drop their antlers after mating season. Females maintain their more slender antlers through the winter. So, according to physiologist Perry Barboza of the Institute of Arctic Biology, University of Alaska at Fairbanks, who studies reindeer, Rudolph and the gang are all really girls. Which is a good thing or Vixen would have some explaining to do. Boo! It's Christmas Cuddling Time!